I knew I wanted to finish off the week with another kid friendly snack. We’ve become a goldfish household but I still love a good Cheez-it. Not the burnt ones or even the unsalted. Neither belong here. I always hated getting a box to only find out the entire thing was under-salted or had an overwhelmingly burnt taste. I know some people love those, but not me. Perfectly done or maybe just under done, with a generous amount of salt. Though, there is a fine line between perfectly salted and over-salted. Not to be too specific or anything. I realize there are more important things in life than having issues with a box of cheese crackers, but when you’re craving something and it turns out awful. Well… that just makes your day rotten. Or maybe worse than it already was, which could be pretty bad. Right? Have you ever bit into an apple that *gasp* was lacking flavor, or opened a box of something to only find out it was somehow already stale? Those are the things of snacking nightmares. I haven’t had a Cheez-it in years. But between those and their fishie friend, I love a good cheese cracker or snack. Even a slice of cheese on a cracker. 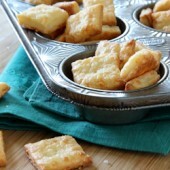 A while back, Katrina shared a recipe for a homemade version of those beloved cheese crackers. I knew they’d be the perfect conclusion to the week before school starts and boy am I glad I made these! Such basic ingredients, who knew they’d turn into crisp, airy, cheesy crackers? Slightly over-bake for more crispness. 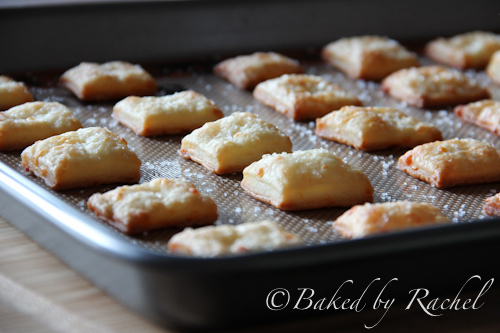 But truthfully, these are perfect no matter when you remove them from the oven. 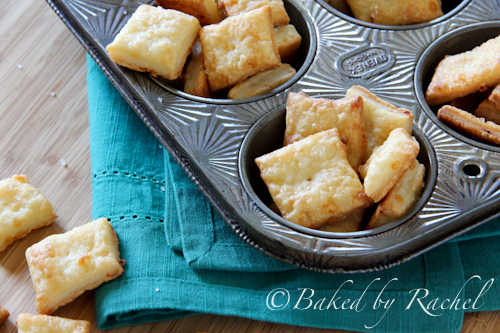 They’re like pastry crackers full of cheese flavor. So gooood! I made half a batch with red pepper flakes for a fun spicy kick. They didn’t disappoint! If you love spicy snacks, you’ll love that variety. Best of all, these are pretty quick to whip up and you can totally get your kids involved! In the bowl of a stand mixer, combine cheese, butter, shortening and salt on medium-high speed. Reduce speed to medium, slowly add flour and water. If adding red pepper flakes, do so now. Divide dough into two, creating discs and wrapping in plastic. Chill for at least 30 minutes (I let mine chill overnight). Roll out dough to 1/8" thickness. using a ruler as a guide, cut long horizontal strips. Rotate ruler to slice vertically, creating squares. 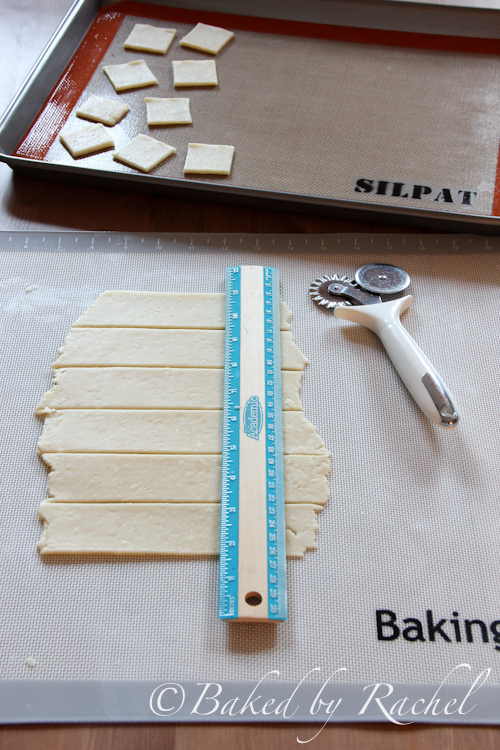 Carefully transfer individual squares to prepared baking sheet. Repeat process with remaining dough. Using a toothpick or cake tester, create holes in the center of each square. 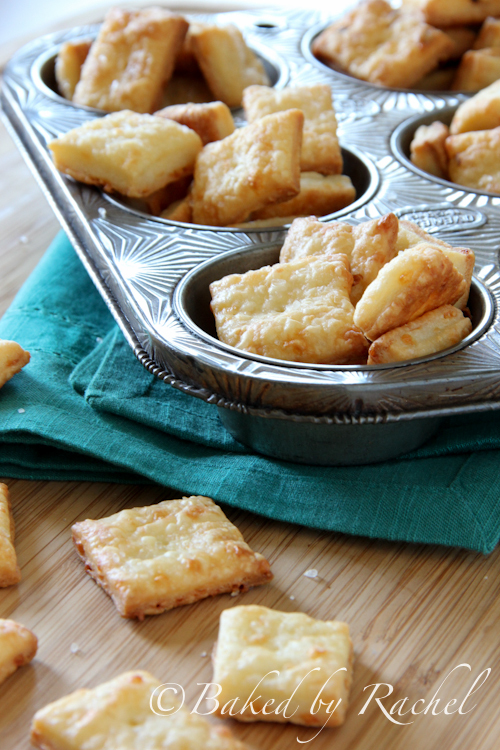 *Notes: For spicy cheese crackers, use 1/2-1 tsp red pepper flakes. I used 1/2 tsp for half a batch.